The 'ShipCraft' series provides in-depth information about building and modifying model kits of famous warship types. 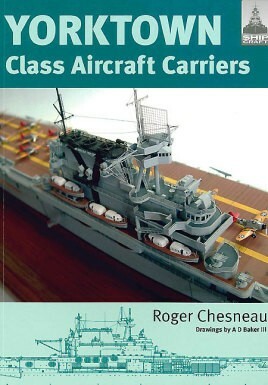 Lavishly illustrated, each book takes the modeler through a brief history of the subject class, using scale plans to highlight differences between sisterships and changes in their appearance over their careers, then moves to an extensive photographic survey of either a high-quality model or a surviving example of the ship. Hints on building the model, and on modifying and improving the basic kit, are followed by a section on paint schemes and camouflage, featuring numerous color profiles and highly-detailed line drawings. The strengths and weaknesses of available kits of the ships are reviewed, and the book concludes with a section on research references - books, monographs, large-scale plans and relevant websites. The subject of this volume is the Yorktown class, the near-legendary American aircraft carriers that kept the Japanese at bay in the dark days between Pearl Harbor and the decisive battle of Midway, where Yorktown herself was lost. Hornet launched the famous Doolittle Raid on Japan before being sunk at Santa Cruz in October 1942, but Enterprise survived the fierce fighting of the early war years to become the US Navy's most decorated ship.